Samir Nasri is expected to undergo a medical at Carrington before completing a move to Manchester City over the weekend, amid growing claims from his homeland that the wayward Frenchman actually had his heart set on a move to…this isn’t going to go down well…Manchester United when he decided to pull the plug on his tenure at Arsenal over the summer. Reports emanating from France this morning are suggesting that Nasri informed his representatives that he’d only be willing to leave for his preferred choices – United, Barcelona or Real Madrid – presumably right up until the point that neither of the Spanish sides showed the slightest bit of interest in him, Arsenal refused to sanction a move to Old Trafford and City wafted a £175,000-a-week deal under his nose. Is there still time for a last-minute gazumping? Or would United be better off dodging the bullet on this one? It’s too bad I would have liked him at United, but he’s not worth those ridiculous wages and not worth the unnecessary transfer fee either. If he really had his heart set on United and not dollar signs in his eyes, he would have played on Arsenal for another year and left on a free sans drama. I think he would be a fantastic addition to any team. And the gods know that Man United need some more creativity in the middle of the park. He should be in the line up of United, it includes some of the ugliest players in football. Neville, Rooney, Ferdinand. Montesquieu, Neville doesn’t play for United anymore. 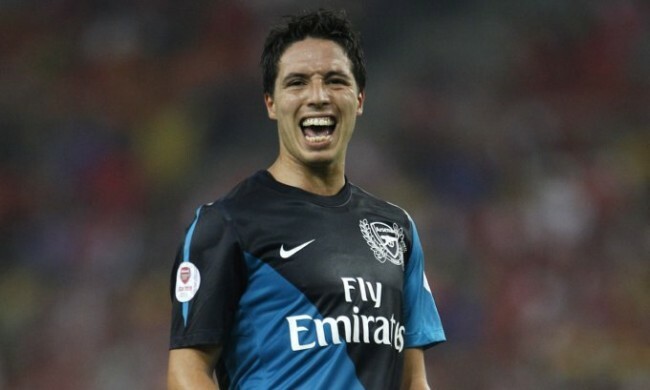 But I would have loved Nasri to come to United. Arsenal are idiots as City are more their level than United are. Almost as if Arsene has jus seen a big Self-Destruct button and pressed it. He’ll goto City and get “Milnerized” – on the fringe and half the player he once was. He should have gone home to PSG. @Ryan – I like the idea of him going to PSG. It seems their “revival” was signing Pastore… and that’s it. But, I understand him wanting to stay in England. If he wanted to play for United, he would’ve signed for United. The same goes for Wesley Sneijder. While I believe Sniejder to be worth the paycheck and Nasri not so much, if either of these guys valued playing for United more than a few extra thousand sheckles, they’d be playing for United right now.